There’s one last specialization that I haven’t talked about yet in terms of builds, and that’s the Templar. Despite my early thoughts on this spec, it works far better with a two-handed weapon than with a shield and one-hander. There is no reason to use anything other than a Champion warrior for tanking, especially considering the Templar’s high damage potential with 2-handed skills, and most of all, their amazing damage combo. Not to mention, Templars have a talent that gives the party a whopping 50% damage boost whenever they fall unconscious in combat – so you WANT your Templar to be dying every once in a while! The build is very simple, and also very fun to play thanks to your self-combo (Wrath of Heaven + Spell Purge). 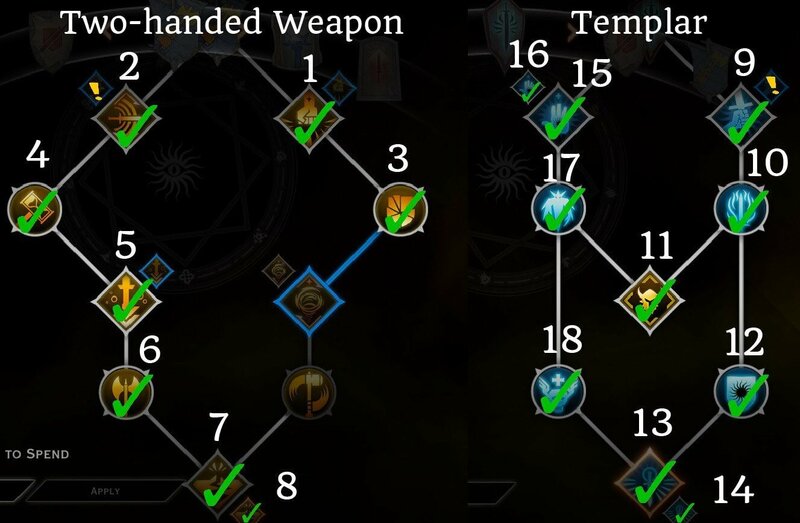 The build relies on the two-handed tree to provide you with DPS passives/skills, while the Templar tree gives you a high damage combo and your amazing buff/debuff skills. Templars give the party 25% bonus damage, 10% damage resistance, a further 50% damage boost anytime your Templar is unconscious, and a team-oriented Focus skill (Rally). The Wrath of Heaven + Spell Purge combo in action. Your damage certainly won’t be as a high as a Reaver warrior, but the buffs you provide for the party, and the debuffs you put on the enemy more than make up for that. 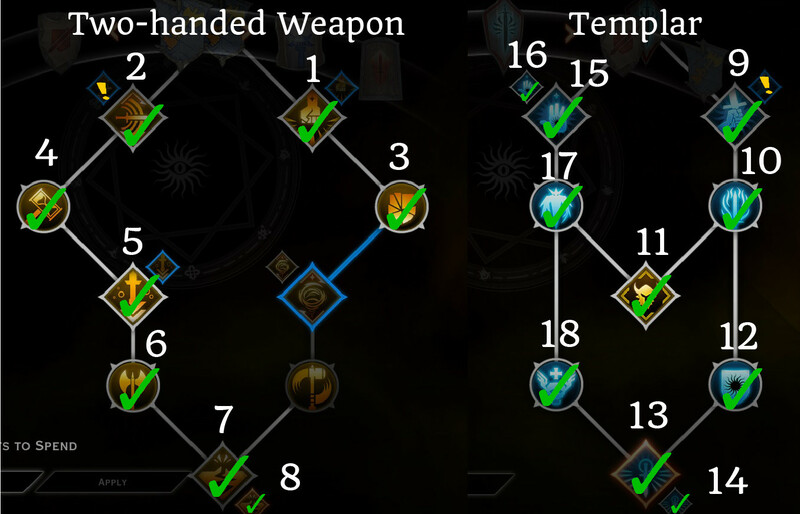 I’m usually not a fan of the Earthshaking strike skill, but considering that Templars are lacking in DPS skills in their specialization tree, its a good way to round out your arsenal of damage abilities. Note: If you’re having trouble surviving at early levels (1-10), make sure to drop a few points into the Vanguard tree to pick up some guard-generating skills, like Charging Bull and Unbowed. You can keep them until late-game, or respec later on, when you no longer need them. I would also highly recommend crafting your Templar a Fade-Touched Silverite masterwork to generate 5 guard whenever you attack, so you don’t have to worry about dying. Run into a group of enemies, and open up with Wrath of Heaven, and then immediately use Spell Purge for a damage combo – in my experience this is the HIGHEST damage combo in the game, and the best part is, you can cast it by yourself! 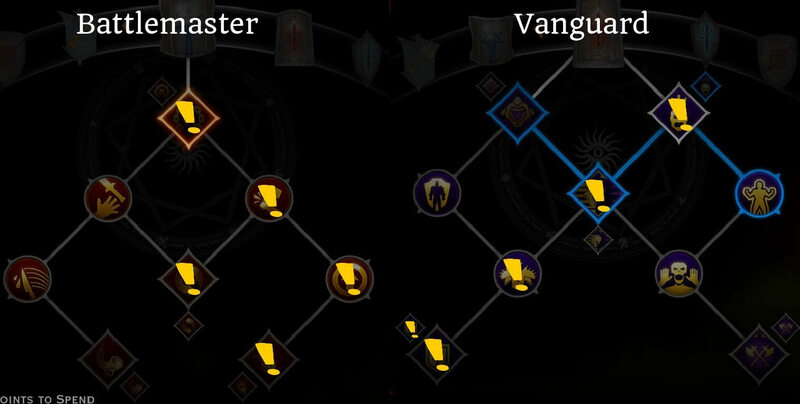 Battlemaster: I’m not a big fan of the Battlemaster tree, but there are a couple of useful passives and skills here, like Deep Reserves (regenerate stamina faster) and Combat Roll to give you a way to dodge dangerous attacks like a Dragon’s breath. Vanguard: This tree is a good addition for 2 reasons. 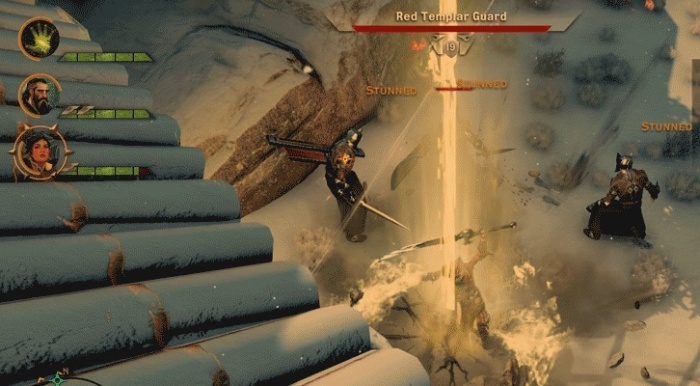 First, it will allow your Templar to survive at early levels (before you get to Skyhold) by generating guard. Second, it will allow you to off-tank, so that if your main tank misses an enemy or loses aggro, you can taunt and tank it for a short period of time to save your mages and rogues from dying. Extra points you can spend in Battlemaster or Vanguard. I know i’m late to the party, but I started playing DAI again and for some reason this build seems way weaker than it was before, and the combo seems to activate way less (as far as I can tell only the standard enemies, no bosses or heavies, will trigger) even pride demons are immune. Did I mess the build up or did they nerf it or something?